The Swiss company Magnin, member of a Swiss coop, added strawberries to its range of vegetable crops in 2008. They currently have about 1 ha of strawberries, both under glass and in open field. Crop manager Sylvain Lappe had worked with biological control in vegetable crops and was determined to do the same on strawberries. He went through some ups and downs in the first years, but together with Biobest advisor Julien Mourrut-Salesse he persisted and now he’s quite satisfied with the results of the predatory mite A. swirskii in combination with NutrimiteTM. 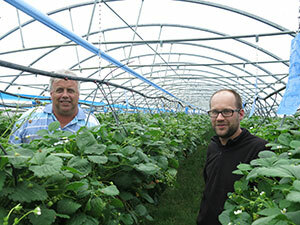 Sylvain is happy to share this experience with other strawberry growers. With Western flower thrips (Frankliniella occidental) being the most significant pest problem, Sylvain initially relied on the predatory bug Orius laevigatus in combination with a single release of the predatory mite A.swirskii. Orius is well-known for its aggressiveness against thrips. The success of Orius in fruit crops depends on a number of specific circumstances, but the approach worked well for Sylvain. Then in 2010, a secondary pest suddenly became more important. Its name: Liocoris tripustulatus, a newcomer in the Geneva area. Biocontrol agents were not available against Liocoris and hence chemical intervention was necessary. “The problem is that Liocoris belongs to the same insect group as Orius”, says Biobest advisor Julien Mourrut-Salesse. “Every chemical that controls Liocoris also hits Orius. A thrips biocontrol strategy built on Orius was therefore no longer an option”. “We used 500 grams per hectare, every 15 days”, Sylvain continues. “It takes no more than 45 minutes to blow the pollen on one hectare. We applied the powdery substance with a Makita blower extended with the special Nutri-app provided by Biobest. We are used to control powdery mildew on our fields with sulphur powder, so it didn’t cost us a lot of effort to incorporate this in our routine operation schedules – however, we don’t mix sulphur and Nutrimite™, we apply them separately. The Magnin company, owned by Philippe Magnin and part of the cooperative Union Maraîchère de Genève, is based in Lully, near Bernex in the French-speaking part of Switzerland. In the past the company focused on cucumber and tomato cultivation. Since 2008 Magnin produces strawberries of a unique variety: Mara des Bois. This is a French strawberry that is well-known for its intense taste. Nutrimite™ is a specially selected pollen type with high nutritional value for predatory mites. It’s being used in a growing number of crops to boost population development of predatory mites. In particular it works with predatory mites that can feed on pollen. For example, populations of A. swirskii grow explosively when they’re being fed with Nutrimite™ on a two-weekly basis. Within a few weeks one will observe exceptionally high predatory mite population levels in the crop. No need to worry about Nutrimite™ promoting the development of thrips. Nutrimite™ is unattractive for both Californian and Echinotrips. The strong predatory mite population guarantees better control!